The 2015-16 McFarlane NBA 27 Sports Picks lineup has its share of stars, but it might lean slightly towards regional approval than mass appeal. While the biggest stars have earlier figures, there are a couple of debuts including one from the 2015 NBA Champion Golden State Warriors. James Harden, Anthony Davis and Chris Paul are the McFarlane NBA 27 headliners as far as star power goes. Harden, the 2014-15 MVP runner-up, debuted in NBA 23. Davis is also appearing on his second figure. He debuted in NBA 24. This marks the fourth time Chris Paul has been in a Sports Picks lineup and second with the Los Angeles Clippers. Pau Gasol is getting his third figure and first as a member of the Chicago Bulls. He last had a McFarlane in 2010's NBA 17. Golden State's Klay Thompson and Eric Bledsoe of the Suns are the two debut figures in 2015-16 McFarlane NBA 27. All of the figures except Harden have limited edition variants planned that will show players in different jerseys. 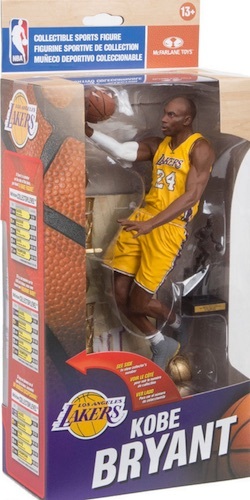 Although it's not officially part of the McFarlane NBA 27 lineup, there's also a commemorative Kobe Bryant figure coming out around the same time. Packaged in a box that's sequentially numbered, the Lakers great comes with five NBA Championship trophies and an MVP award. Adding to that, a trio of figures for the Golden State Warriors celebrate their 2015 title.